One of the things we did to get Annie to go to sleep at a set time was to create a bedtime routine that we repeat every night. It worked great (except for the occasional hiccup) and Annie now loves her bedtime routine so much that we often find her pretending to put her dolls to bed! Last night Heather started to doze on the couch, so I asked Annie if she wanted to put Mama to bed. Annie was very excited at this prospect, and proceeded to go through many key portions of our bedtime routine including tucking Heather in with her dolls, singing her “Goodnight” by The Beatles, and giving her a night-night kiss! Now if only someone would put me to bed! that had to be the cutest thing ever! So heart warming. She is so smart. Lights out on her own. Close your eyes and the love in her voice. All a beautiful “mirror” of your reflection. Her singing is absolutely precious. Seriously, it does warm the heart. Thank You for sharing! It’s heartbreakingly cute when she turns out the light and starts singing. So precious!! Oh my goodness, that was seriously one of the sweetest things I have EVER seen. That is soooo sweet. I love that she turned out the lights! So sweet! What a wonderful girl! Awwwwwwww!!! I love when she turns out the lights to sing!!! That is about the sweetest thing I’ve ever seen. LOVE her turning off the light and singing! Cutest thing I have ever seen! Thanks for sharing! It’s no wonder you call her “Amazing Annie” — she truly is!!! I loved it when she turned out the light and sang the song without hesitation….soo utterly precious!!!! OMG, that is priceless! 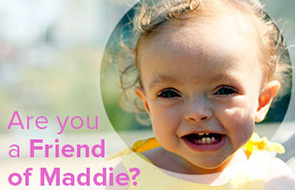 She is so unbelievably precious…you can tell how much that bedtime routine has meant to her! That just made my day!!! So precious. I predict a rise in the number of babies born 9 months from now because of this video! That is the absolute most precious thing I have ever seen!!! Awww…Annie singing in the dark just made my day!! SOOOO cute! My little guy is only 20 months, so can’t quite sing like that, but he tries. Adorable! Night-night Heather! I love the “Now close you eyes…” So cute. Oh that is the sweetest thing ever. When she started singing, I seriously almost started crying! Precious! There are not enough adjectives to describe how preciously cute and wonderful that was and how that child is. You are so lucky to catch these moments on video. Just adorable. She is such a little sweetheart! love this video….new favorite! This is so very sweet. I love that y’all sing “Goodnight” by The Beatles, my dad used to sing that to me when I was little, too. This has to be one of the sweetest things I have seen in ages! Thank you for sharing! Oh my gosh, she kills me. I have a new favorite Annie video. So sweet. That is so skinkin’ cute! Okay, that was the cutest thing ever. … and I bet she’d be more than happy to put Dada to bed too, if asked. The almost-3-year-old I watch likes to do this, too. Yesterday, she pretended to put me to bed in her room, then she went out, closed the door, and rattled the doorknob. It’s the kind of door where you have to pull on it a bit, to make sure it’s latched, but I don’t think she knows that, I think she just believes that part of the bed time routine is to make noises with the knob. That…was adorable! And good job singing and remembering those lyrics Annie! That girl of yours is SO smart and so incredibly adorable!!! Hearing her sweet little voice sing that song brought tears to my eyes! OMG my heart just melted – that was the cutest thing I ever saw – what a sweetheart! Your both children are so beautiful! You really make awesome babies! This video is so sweet! I know both of you are beautiful and very smart so I understand the good genes but how did you nurture them before even they were born? Can you share the secret with us? Kudos to you guys for creating such a meaningful routine. As I watched Annie tuck Heather in, I could see how safe and loved Annie feels. Because she was giving Heather the love and care that she (Annie) probably receives every night, and she did it with such sincerity. You’re creating an amazing little person, and it’s obvious that there is no doubt in her mind/heart that you love her, and that she knows she can count on you, partly because of nightly routines like this. Oh that is just so sweet and adorable. Oh my gosh… sweetest video ever! That was so sweet. Oh my gosh. Her singing brought tears to my eyes. What a beautiful sound, the voice of a child. Is that Rigby crashed out at Heather’s feet? Adorable!